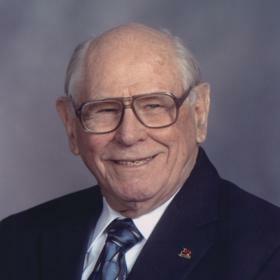 Harry Hans Christiansen, of Norton Shores, MI, died at the age of 97 on May 25, 2018 at Seminole Shores Assisted Living Center. 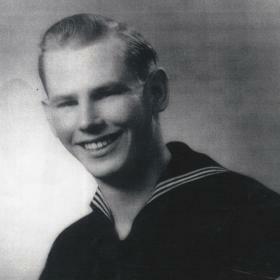 Harry was born January 18, 1921 in Harding, NE to Henry and Catherine (Carlson) Christiansen, immigrants from Denmark. He grew up in Muskegon, MI, and graduated from Muskegon Heights High School in 1939. Harry married Betty Jane Cady on February 7, 1942 and they raised their six children together until Betty's death in 1974. Harry never bought a house for his family, but built three homes for them as their numbers grew. He worked hard to care for his family, first at Sealed Power and Norge and then with a 35-year career at General Telephone. During that time he also built 15 homes for other families, working evenings and Saturdays. He retired in 1982. 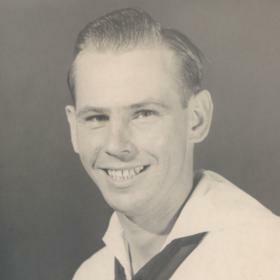 Harry proudly served his country in the United States Navy during World War II from 1942-1945, primarily as a radio man on the aircraft carrier, U.S.S. Hancock. He was grateful to be an American and a veteran. Harry and Betty raised six children: Harry James, Patricia Marie, Casey Allen, Dale Russel, David Lee, and Daniel Dean Christiansen. They gave him numerous grandchildren and great-grandchildren and great-great grandchildren. He was devoted to his family and friends. Harry received Jesus Christ as his Savior as a child and that relationship shaped his life. He never claimed to be perfect, but he sincerely sought to live a committed Christian life. He was a lifelong member of Bethel Baptist Church in Norton Shores and served there in various capacities over the years. He had an impact on hundreds of young people over the years as he took them camping and taught them to water ski. His heart's desire was to see people put their faith in Christ and live in His plan. Harry loved sports and played softball, tennis, and golf well into his retirement years. Harry is survived by four sons: Casey (Patti), Dale (Lida), Dave, and Dan, along with a brother, Henry (Janet) Christiansen, a sister Lillian Johnson, and a sister-in-law Virginia Shaw. He'll be missed by all his grandchildren, great-grandchildren, great-great grandchildren, nephews, nieces, and friends. Harry was preceded in death by his parents, Henry and Catherine; his beloved wife, Betty Jane, his oldest son Harry James, and his only daughter, Patricia; as well as, a sister, Clara Downey and three brothers, Erle, Clarence, and Vernon. He has said a sad good-bye to many others along the way, including his wife's siblings and other family and friends. He will have many to welcome him to his eternal home. Tuesday, June 5, 2018, 11:00 am with visitation one hour prior at Bethel Baptist Church of Norton Shores with Rev. Douglas VanderMolen & Rev. Dale Christiansen officiating. Interment in Norton Cemetery. MEMORIAL: Bethel Baptist Church of Norton Shores Memorial Fund.